1. Membership is open to all Belmont Shoppers. 2. 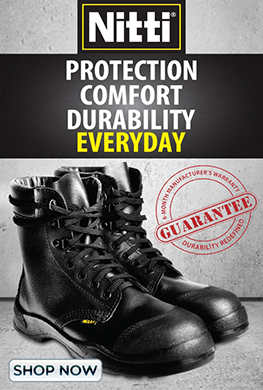 No Minimum or initial purchase requirement. 3. Interested individuals must fill up the application form. Application forms are available at the Customer Service Desk. 4. Submit application forms at the Customer Service Desk or drop them at the designated drop box. Service Desk within 3 to 5 business days upon submission of application. 6. Membership fee is Php 150.00 to earn points. 7. Membership can be extended up to three sub accounts. Sub accounts purchases will be added to the main account. 1. Earn one points for every peso spent. 2. Any centavo value will be dropped in the calculation of points. Points are automatically computed and updated right after every purchase. 3. For points to be credited to the member's account, the Belmont Business Reward card must be presented upon payment. No card no point credit. member should keep all the receipts and present them to the Customer Service Desk for point validation. discounts, consumable items such as: Abrasive, Resin chemicals are also not included in the computation of points. 6. All payment made applies in the point computation - Cash, Credit Card, and On-date checks. 7. Points earned from items which are returned or replaced will automatically be forfeited. 1. Rewards will be available upon reaching 15,000 points and every succedding 5,000 points earned. 2. Rewards are redeemable only as discount and at the time it is available. 3. Rewards can be redeemed at any cash counters only. 4. Rewards earned can only be claimed by the principal/main account holder. 1. Belmont Business Reward membership is valid for 2 years. rewards earned will be forfeited. 3. Account of members who have been inactive for six months will be cancelled and all points rewards earned will be forfeited. member to extend its account to another 2 yrs. 3. Points and rewards of the membership which have been renewed will remain and can be used after the renewal. surrender the old card to the Customer Service Counter. 5. Faulty cards should be surrendered to the Customer Service Desk for replacement. Replacement is for free. 6. Replacement for lost and damaged cards will be charged P50.00 as replacement fee. transferred to the new card. 1. Points reflected in the Cebu Belmont, Inc. records and the member's card is considered official. prejudicial to the program take place. 3. 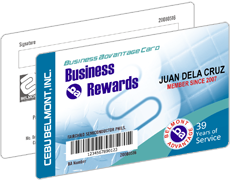 The member is solely responsible for the use of the Belmont Advntage Business Reward Card, whether it be used by the member or by a third party. 4. Cebu Belmont, Inc. reserves the right, at its sole discretion and without prior notice, to cancel , modify, or restrict the loyalty program at any time. from the date of cancellation. 6. Cebu Belmont Inc. failure to enforce a particular term, condition, or guideline does not constitute a continuing waiver of the term and condition. 7. All card issued are non-transferable. signing the Belmont Business Reward application form.